Today’s band is one that became a household name in the mid-1980s based on a one-off hit, but hasn’t made any commercial impact since, lost in the hearts of 80s nostalgia and easily dismissed as a one-hit wonder. Truth is that today’s band, Modern English, were more than capable of writing a myriad of other amazing songs, and a handful of seminal records in an emerging post-punk scene, even if they went mostly ignored by all but the impassioned. This Essex-based band originally began in 1977, originally christened the Lepers. 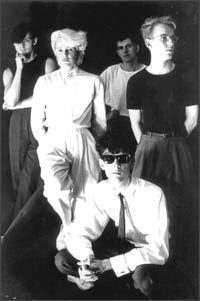 The band released a one-off single before changing their name to Modern English and signing to a budding 4AD records, the band being the first that Ivo Watts-Russel approached after creating the label. Both stylistically, and commercially, Modern English helped put the label on the map. Musically, the band originally drew heavily from the doom and gloom of fellow contemporaries Joy Division and Bauhaus, a rude awakening for fans who stumbled across them after the perfect pop song ‘I Melt With You from their 1982 sophomore record, After the Snow. Pressured after such a large success, the band fell apart after one more record, two of the original members departing for greener pastures, but instead of a side-project, the band revamped and kept pushing forward, occasionally releasing records into the 90s. Though they remained a college favorite, the band never again broke the US or UK charts. Despite sporadic output, Modern English remain together to this day, playing gigs from time to time. The band has a new recording contract with A.P.G. as of 2001, but there’s no clear word as to when to expect new material. This entry was posted on August 15, 2007 at 4:04 pm and is filed under 1980s, 4ad, british, modern english, post-punk, wave . You can follow any responses to this entry through the RSS 2.0 feed You can leave a response, or trackback from your own site. Love the new photo, BTW. modern english are one of my favourite bands. the first two albums are fantastic. it’s great to see them mentioned here. keep up the great work.
. . . I feel like I’ve finally found a kindred spirit. . .
I’m definitely gonna have to keep an eye on your blog. . .
. . I can’t wait to dig all the way through it after work. . .
@mike- thanks! glad you’re into it so far…all the links for the past posts should be active, and the tunes are diverse despite the limits, hope you dig ’em! saudade and miss natty- thanks, dear!